Riyadh – Custodian of the Two Holy Mosques King Salman bin Abdulaziz confirmed Saudi Arabia’s keenness to provide an example for protecting the rights and legitimate freedoms, and achieving prosperity and comprehensive social development, in accordance with Islamic Sharia, all the while preserving the social security and enhancing confidence in our religion and between the citizen and government officials. King Salman’s statement came in a speech delivered on his behalf by Prince Khalid al-Faisal bin Abdulaziz, Advisor to the Custodian of the Two Holy Mosques and Governor of Makkah Region, at the opening ceremony of the international conference on intellectual orientations between speech freedom and Sharia fundamentals, hosted by Muslim World League (MWL). 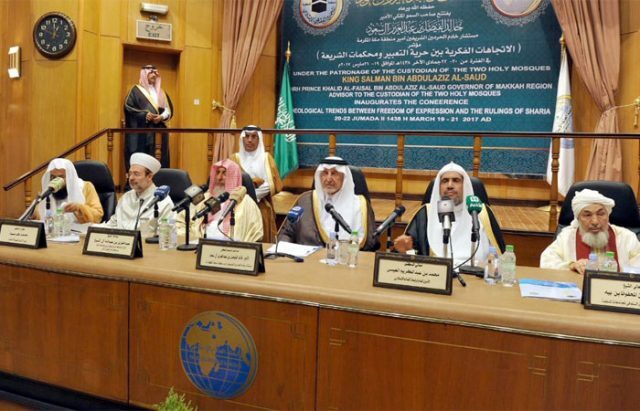 At the conference titled “Intellectual trends between freedom of expression and Shariah regulations,” Prince Khalid said that freedom of expression is an integral part of the overall freedoms and it is granted in Islam, which says that Allah created all humans free. Prince Khalid said that, as per the holy Quran, humans are free to have their blood, money and honor preserved and remain free except from worshipping God Almighty. He said the Islamic Fiqh Assembly reaffirmed, at its 9th session eight years ago, that expressing opinion is protected in Islam in line with Shariah, including that serves the interests of Muslims. Prince Khalid added that expression of opinion should not involve attacks on religion, its rituals or sacred places, and should show commitment to honesty, integrity and impartiality, adding that one’s opinion should work to protect the interests and values of the community, and not be detrimental to public order or lead to discord between Muslims. At the same time, opinion should be formed based on reliable sources and people should not promote rumors, he stated. “We have recently seen many controversies about freedom of expression, especially on social media, which have no controls, but we strongly believe in the capacity of Islamic Shariah to protecting rights and freedoms,” he said, adding that the Kingdom is keen to be an example of a country that protects human rights. The prince said that the conference is hoped to shed light on the important issues that correct any misinterpretation about the Islamic religion that may have been formed due to misinformation or an impulse. Prince Khalid said media should be a tool of good that spreads spiritual values and humanity; they should be responsible and aware of the danger pose by the publication of items harmful to religious values or leading to discord. He added that according to Article 39 of the Saudi law: “mass media, publication facilities and other means of expression shall function in a manner that is courteous and fair and shall abide by State laws. They shall play their part in educating the masses and boosting national unity. Secretary General of the Islamic Fiqh Assembly Salih al-Marzouqi said Islam is a basic pillar in building correct human relations, and that it is responsible for the establishment of justice, respect, security and development. He said that since the establishment of Saudi Arabia, it had adopted the causes of Islam and Muslims and its kings stood against deviant thoughts that undermine some Arab and Muslim countries. Since its establishment, the Islamic Fiqh Assembly had held 22 sessions with over 130 resolutions about religion and creed, and other economic, social and medical aspects. He also said that the assembly will hold two sessions in Europe this year. In addition, the assembly issued a number of recommendations and resolutions, including those trying to equate Islam with terrorism or Islamic countries like Saudi Arabia. The event was also addressed by MWL Secretary General Mohammed Abdulkarim al-Eisa, who said that personal freedom, which emerged in the social development in the West, is strongly respected the Muslim world. He added that there have been exaggerated demands to allow people to say or behave whatever way they want, even if not conforming to Islamic teachings. Also during the conference, Grand Mufti of Saudi Abdulaziz Abdullah Al Sheikh said that Islam is a religion to guide people to the right path. He said the Quraan tackles all issues related to life, faith, God and eternity. He also added that in this Holy book, one can find all rules that govern the life of humans, and how they should deal with one other.